In the fast-paced, ever-changing and increasingly complex automotive world, there are few moments when an industry can take stock of progress. This is one such moment. 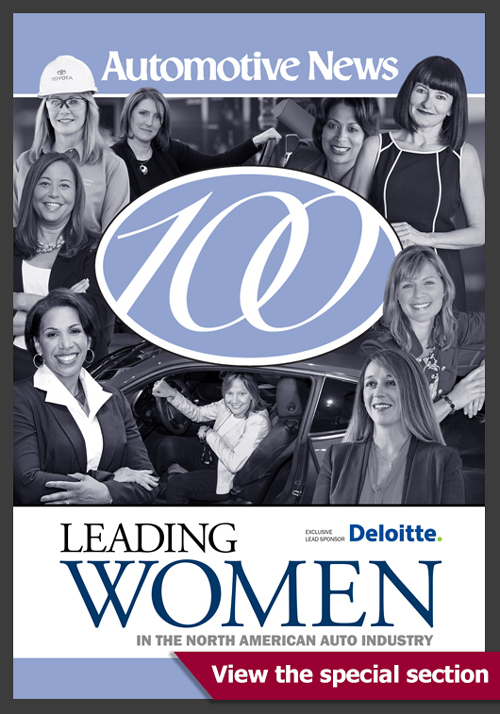 In 2000, when we put together our first list of 100 Leading Women in the North American Auto Industry, we had a difficult time finding women in authority. But times have changed. This year, in assembling our fourth list, we struggled to choose among hundreds of powerful female executives. After the recession reduced leadership roles for women in the industry in 2010, the status of women in automotive has rebounded. 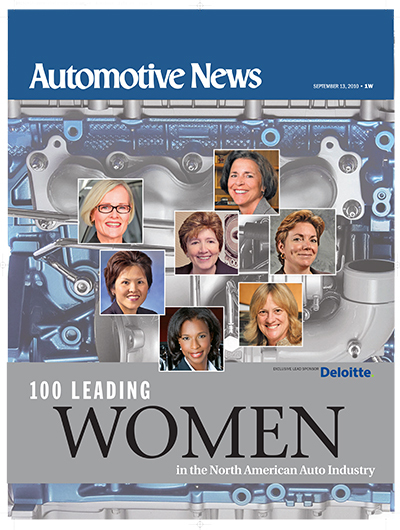 The women honored this year outrank the women named in 2010, with triple the number of CEOs at automakers and suppliers. Don't quit. Learn to play golf. That is some of the advice that the industry's leading women share with their female colleagues. As role models, these leaders feel responsibility for helping other women succeed. Women say striking a work-life balance is a challenge for men and women. But men are less honest about it. These leading women say they have made sacrifices to achieve work-life balance because as leaders, they must shape a culture for the next generation to define boundaries. Mary Barra's decidedly unconventional career arc is now inspiring women in a range of jobs, spanning from rank-and-file engineer to car dealer, to think big. Among the 50 largest publicly held suppliers operating in North America, 52 of the 537 board members are women -- 9.7 percent -- according to a tally by Automotive News. Advocates of gender diversity say it's not merely a matter of being socially progressive. Studies increasingly show that having women on boards is good for the bottom line. This just in: Men and women think and act differently in the workplace. And the differences can make it much harder for women to get ahead in a male-dominated industry such as automotive. For many women, negotiating pay is like having a root canal. That may be one reason why they still earn less than men. Even as the female work force continues to grow, women account for just about a quarter of the combined work force at U.S. automakers and suppliers, a level unchanged in 10 years, according to U.S. Equal Employment Opportunity Commission data from 2013. Why don't more women work in dealerships? Nonconventional hours and commission pay plans are among the reasons many women pass up dealership jobs. Most new-car dealers are men, so sons and grandsons following the footsteps of fathers and grandfathers in the retail auto industry is a given. Mothers and daughters in the business are harder to find, but they're there. Hard-working executives are beginning to ask for time away to reconnect with their families, and companies are responding. 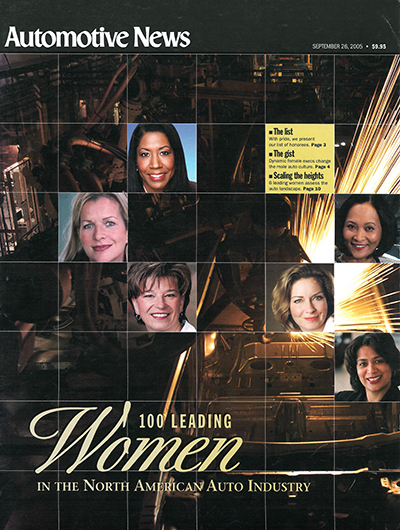 Many of the auto industry's leading women executives found themselves tested by the 2008-2009 economic crisis. 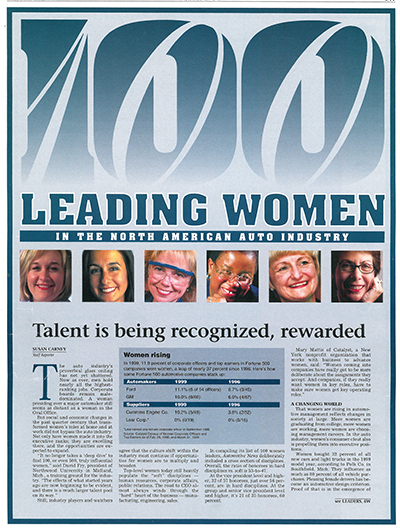 There are dozens of groups in and around the auto industry dedicated to advancing women. While they have different goals and cater to different people, one theme unites them — the desire to see women get ahead in the workplace and in the classroom. Here's a look at 12 of those groups. Lights. Camera. Action! And some cool clothes and makeup, too. Ford provides a backstage glimpse at a photo shoot featuring some of the automaker's female employees who made the 2015 Automotive News 'Leading Women' list. Four Automotive News 'Leading Women' reflect on the people, places and things that continue to inspire them at work and home. All contents © Crain Communications Inc.